QUANTEC Timber preservative is specifically designed for the Australian environment and conditions. This sustainable wood preservative can be applied as a clear oil that fades to a natural silver finish or applied with one of 12 contemporary colours (additional colours available) to enhance and maintain the natural beauty of the timber. 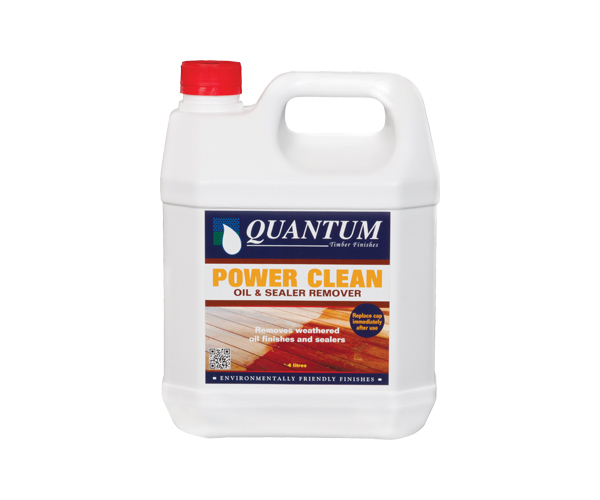 QUANTEC is a penetrating oil that binds wood fibres together to protect against moisture, mould and mildew. QUANTEC helps to prevent swelling and shrinking of the timber that causes cupping, splitting and warping. 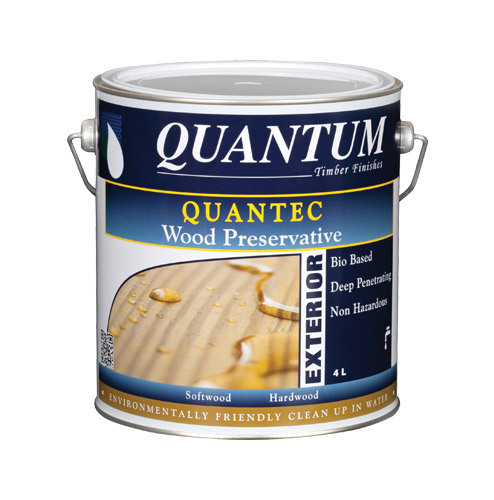 QUANTEC is easy to apply, maintain and a cost effective timber preservative treatment and finish application system. Try this penetrating timber preservative for your next project. 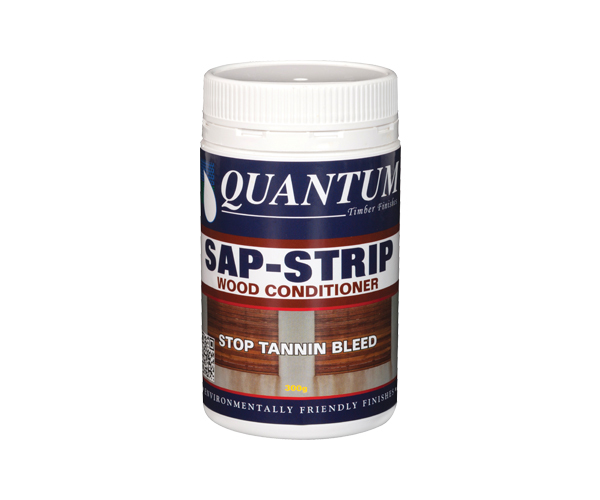 Buy online or visit your nearest Quantum stockist today. Timber must feel dry to the touch before further applications. Drying times under normal conditions are within 24 up to 48 hours. Drying time can be affected by a number of factors including the density & porosity of timbers, temperature and humidity. Do not apply if temperature is below 15°C or above 30°C. QUANTEC is designed to fade over time, it will not crack, peel or flake so rejuvenating faded timbers coated with QUANTEC is simple, easy and cost effective. QUANTEC will lighten and fade faster in full weather exposed areas, whereas timber in protected areas will retain colour with minimal maintenance over time. Clear or tinted QUANTEC should be reapplied as frequently as necessary to retain the natural beauty and colour of the wood. Brush, roller, spray or dip application. New timber: SAP STRIP to remove all extractives and sterilise any fungus or mould. This will help to open the timber grain, and remove mill glaze assisting with the penetration of the coating. 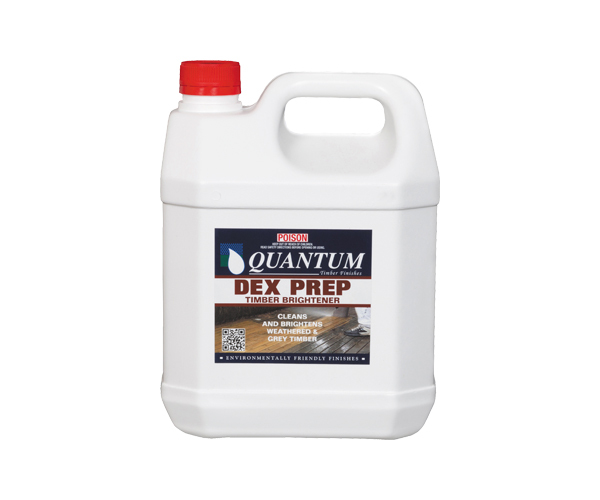 Old Timber: Wash with DEX PREP and a strong jet of water to rid the surface of oxidisation (greying). Note: Timber does not need to be dry prior to first coating. Apply the first coat liberally to allow the coating to soak into the cracks and grain as much as possible. Allow to dry. Apply a second coat once the timber feels dry to the touch. 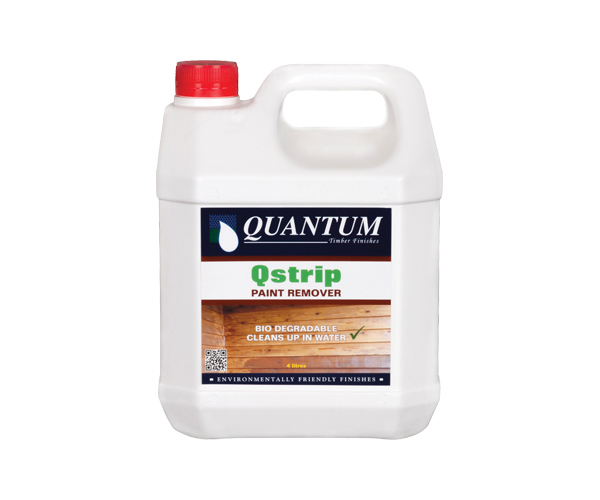 Apply as a clear oil which fades to a natural silver finish, or apply using one of Quantums transparent stain colours to enhance and maintain the timber. Suitable for use on: Exterior timber including weatherboards, doors, plywood, log buildings, decks, shutters, garage doors, joinery, fences, posts, fascia boards, outdoor furniture, spa pools and engineered products. Not suitable for use on: Bamboo and acetylated wood.